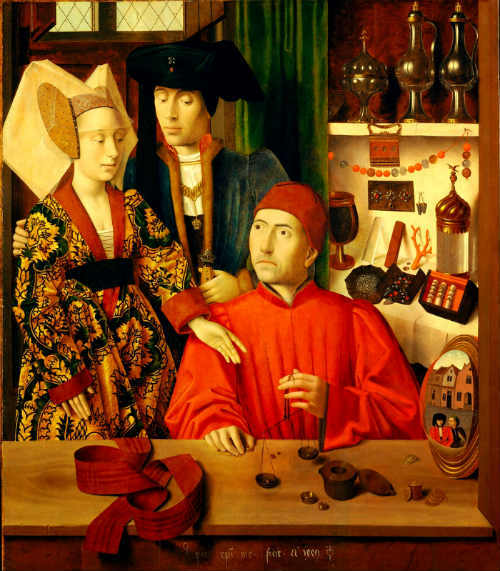 Petrus Christus was one of the greatest painters of the Northern Renaissance. His paintings, are filled with layer upon layer of fascinating symbolic meaning. Author Carleton Noyes exsplains "The symbolic character of a work of art must not be lost from sight, for it is the clue to the interpretation of pictures, as it is of all art. The painter feels his way through the gamut of his palette to a harmony of color just as truly as the musician summons the notes of his scale and marshals them into accord. The painter is moved by some sweep of landscape; it wakens in him an emotion. When he sets himself to express his emotion in the special medium with which he works, he represents by pigment the external aspect of the landscape, yes; but not in order to imitate it or reproduce it: he represents the landscape because the colors and the forms which he registers upon the canvas express for him the emotions roused by those colors and those forms in nature. He does not try to match his grays with nature's grays, but this nuance which he gropes for on his palette, and having found it, touches upon his canvas, expresses for him what that particular gray in nature made him feel. His one compelling purpose is in all fidelity and singleness of aim to "translate the impression received." The painter's medium is just as symbolic as the notes of the musician's nocturne or the words of the poet's sonnet, equally inspired by the hour and place. Color and line and form, although they happen to be the properties of things, have a value for the emotions as truly as musical sounds: they are the outward symbol of the inward thought or feeling, the visible bodying forth of the immaterial idea."